Do you know the first names of Ms. Berton or the unidentified woman? Black and white negative of a group portrait of Ms. Mary Brawley, K. Berton and an unidentified woman taken at the Ontario County Courthouse in Whitby, Ontario. In this view the unidentified women are each sitting on the arms of the chair Mary is sitting in. Mary Gartshore Brawley was born 6 March 1909 at Toronto, Ontario to Robert H. and Elizabeth Fernie Brawley. Her family moved to Whitby in 1915. From 1931 to 1935 Ms. Brawley was the acting Sheriff of Ontario County. She was the first female in Ontario to hold that position at the time. Ms. Brawley married Ian Blake McKay on 22 August 1942. They had one daughter, Sandra. Mary passed away on 17 December 1990 at Ajax, Ontario. She is buried in Mount Lawn Memorial Gardens, Whitby, Ontario. 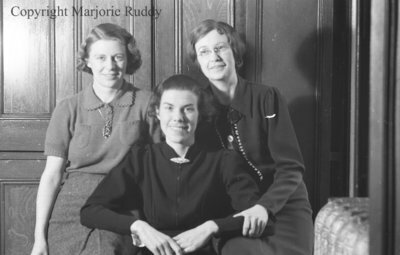 Ruddy, Marjorie Georgina ; Brawley, Mary Gartshore ; Berton, K.
Mary Brawley, K. Berton & Unidentified Woman, February 1938, Marjorie Ruddy. Whitby Archives A2013_040_920D.